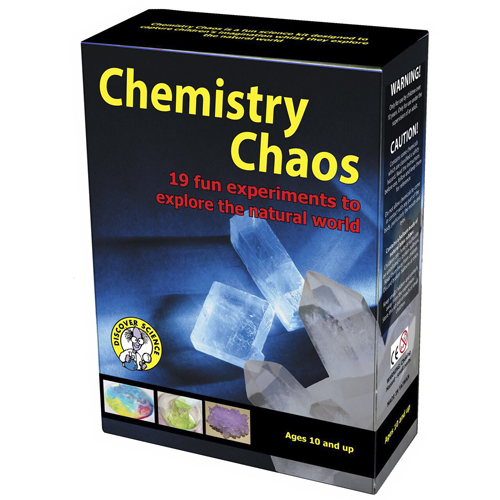 This Chemistry Chaos Science Kit contains 19 fun and interesting experiments to explore the natural world. Learn about Matter, Chemical Reactions, Crystallography, Forensic Chemistry and Qualitative Chemistry, all while creating Lava Candy, Sizzling Sherbet, Salt Crystal Trees, and much more. The kit includes scientific equipment required for the experiments and a 51 page full colour booklet which includes fun facts and further experiments. Ideal as a family kit with experiments to suit a wide range of ages. Perfect for home schooling and as a teacher resource. To complete the experiments some household ingredients readily available from supermarkets or convenience stores are required.